I love food baked in a rustling paper parcel because opening one up is like unwrapping a present. 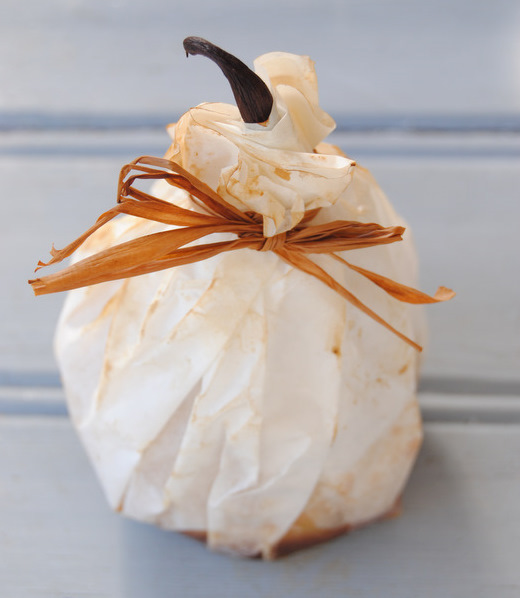 And these paper-wrapped pears certainly smell like Christmas when you unfurl them. This is a dead-easy, quick recipe that can be made well in advance - even the day before. What's more, you can bake them, put them to one side, and then pop them back in the oven - the microwave oven works well too - for a few minutes to heat through just before you serve them. The idea for this recipe came to me while I was admiring a shining heap of pears at my local supermarket. Even though I love pears, I hardly ever buy them for the family fruit bowl because their ripening process irks me. One minute they're rock hard; a nanosecond later they've turned to gritty brown mush. I thought I might stew the pears and put them under an almond crumble topping, but then my eye fell on a roll of greaseproof baking paper I'd just put in my trolley. (I've recently been baking baby potatoes in paper parcels, with fresh mint, salt and butter; this method produces the most tender and fragrant spuds). Do use unblemished, crisp, firm (but not rock-hard) pears for this dish. I used forelles, but I think this would work just as well with Packhams, golden pears or Bon Chretiens. I know it's an extravagance to use a whole vanilla pod for each pear, but you can recycle the pods by drying them out on a sunny windowsill. Use them for the next batch of pears you make, or to flavour a jar of caster sugar. If you can't afford a vanilla pod per pear, scrape the seeds out of a single split pod and mix them with the softened butter before you stuff the pears. If you're going to bake these right away, preheat the oven to 170 ºC. Cut out six circles of greaseproof baking paper (or parchment paper) each the size of a large dinner plate. The best way to do this is to put a plate face-down on the paper and swiftly cut around it with a sharp craft knife. Fill a large bowl with cold water and add the juice of half a lemon. Peel the pears using a potato peeler and drop them immediately into the lemony water. When all the pears are peeled, use an apple corer to remove the cores and stalks (take the entire core out, so the chocolate can run out as it melts).. Trim the base of each pear so it stands up upright. Put the pears back into the water to prevent them from browning. Getting the pears ready for wrapping. 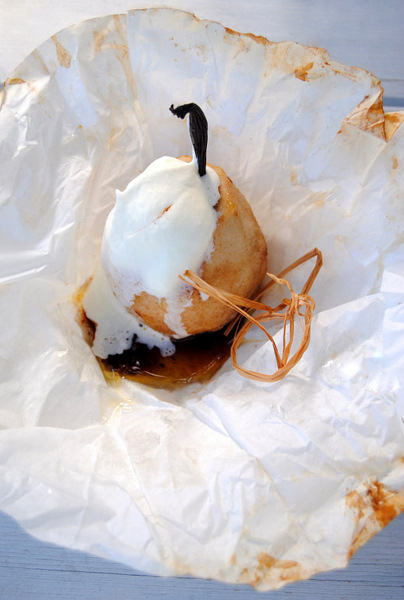 Put a circle of baking paper on the counter and stand a pear on it. Into the cavity place, in this order, two or three squares of chocolate broken into small pieces, half a teaspoon of butter, and a teaspoon of sugar. Push a vanilla pod into the cavity, allowing its end to protrude like a pear stalk. Sprinkle two more teaspoons of sugar and a few drops of lemon juice over the outside of the pear. Gather up the edges of the circle to form a parcel and secure with a piece of damp raffia (or string) tied just above the top of the pear. Repeat with the remaining pears. Place the pears on a baking sheet and bake at 170ºC for 40-45 minutes, or until they are very soft but not collapsed. Place each parcel into a shallow bowl and serve immediately, with whipped cream or custard. Oh my word Jane-Anne! This is genius! I love recipes like this that showcase beautiful ingredients effortlessly. have to try it out. I agree with you 100% on the life expectancy of a pear. Only about a day window of perfect eating opportunity. 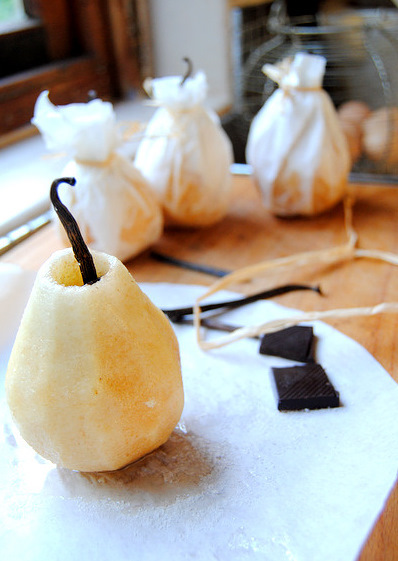 I love baked pears, its by far the best way to deal with this fruit. taking them from ordinary to extraordinary. Yum! Brilliant work Jane. Really it is so clever and the pics are awesome! Dear friends. Thank you for your comments. They are very much appreciated. This is lovely!!! A share bundle of joy......... Love it. Those are so pretty, and they look delicious! Oh wow, your pears look to die for!!!! I've always baked vegetables en papillote but never fruit. I will have to try this. This is stunning. The recipe, the technique, the photos... everything! I'm tucking this away for a warming fall dessert :) Thank you! Thank you for these lovely comments. Am just imagining what heady perfume the vanilla pods impart to these pears - boy would I love to rip open a parcel like that! When coring the pears, do you go all the way through the pear or stop part way? I'm not sure if the chocolate mixxture is supposed to remain in the part or should it be able to flow out the bottom once in the oven? Thanks! Wow, that's a beautiful presentation! I've been looking for en papillote recipes and this is by far the prettiest I've seen. Thanks for the directions. Thank you very much! Your comment is much appreciated.